Cash application is a process relating to accounts receivable (AR), where incoming payments are applied to the corresponding customer invoice. Whether it is a cash or wire (EFT) payment, a monthly bank reconciliation is performed by the accounts payable (AP) assistant and the AR assistant within two days of month-end. It is then reviewed, signed off and filed by the financial controller. For all businesses there are risks that exist and need to be identified and addressed in order to prevent or minimize losses. 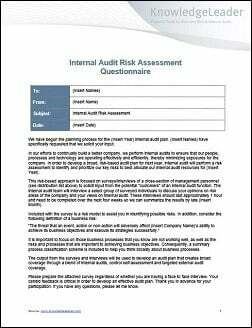 As part of their Sarbanes-Oxley compliance efforts or enterprise risk management programs, many internal auditors are involved in training process owners to assess risks and take responsibility for managing internal controls. In this effort, it is important to acknowledge the process owner’s responsibility for the design, implementation and maintenance of the control structure within assigned business processes. Process owners are also expected to: contribute direction to identify, prioritize and review risks and controls; remove obstacles for compliance; and remedy control deficiencies; continue or begin a program of self-assessment and testing to monitor the controls within your processes. This guide was developed to help with this training activity.